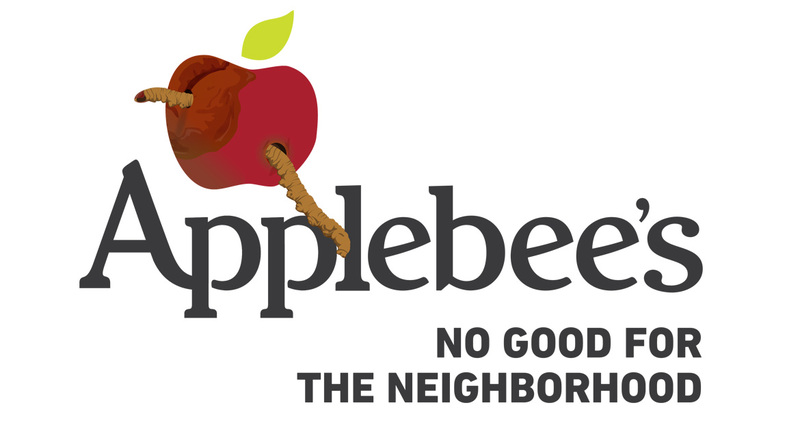 Applebee’s is the largest U.S. restaurant chain that doesn’t offer a single vegetarian entrée at over 1,900 of its locations. 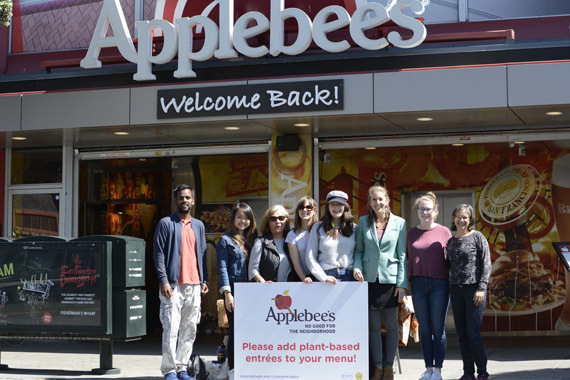 That’s why OMD and the Center for Biological Diversity joined forces on a national campaign encouraging Applebee’s to offer plant-based entrées, kicking off with an exciting, National Day of Action. 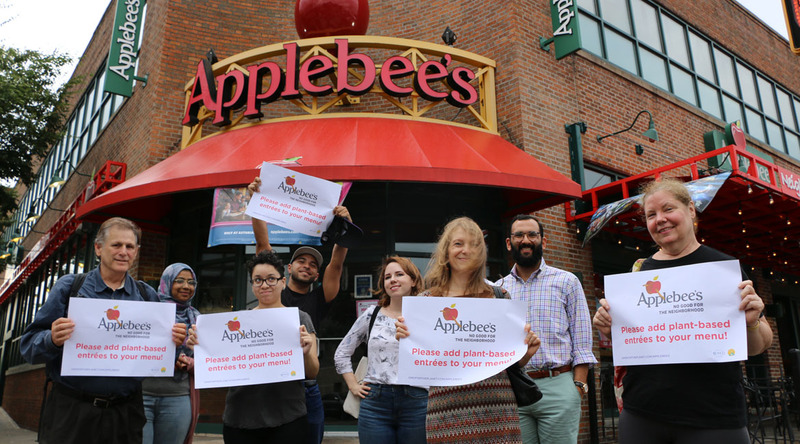 On Sept. 18, we rallied outside Applebee’s restaurants from California to New York, sharing information with restaurant managers, and offering comment cards to diners who might be interested in requesting a plant-based menu option. And in celebration of National Cheeseburger Day, we also handed out plant-based burger samples donated by Hungry Planet to passersby to invite them into the world of delicious meat-free meal options! Applebee’s recently began offering a vegan burger option at a few New York locations, and we think that’s a great start. But it’s not enough. 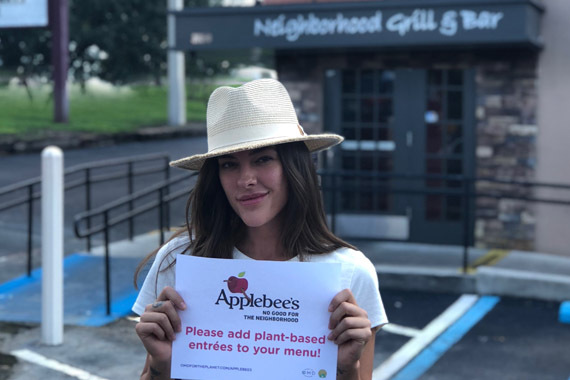 We believe that diners at every Applebee’s location should have plant-based entrée options for better access to healthy foods around the country and for the planet. Evidence shows that the number of consumers who want to limit their consumption of animal products is growing. Many prefer to eat plant-based because it’s better for their health. Eating excessive animal protein is linked to an increased risk of chronic illnesses like heart disease, diabetes, and cancer. Others make the choice because they know that animal agriculture is a leading cause of climate change, deforestation, biodiversity loss, and water pollution. And others feel strongly that they don’t want to eat animals. 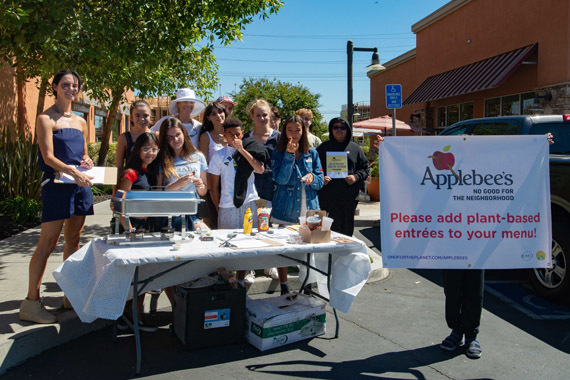 In Chatsworth (a suburb of Los Angeles), students from the MUSE School turned out to help pass out samples and to take a stand for the planet. 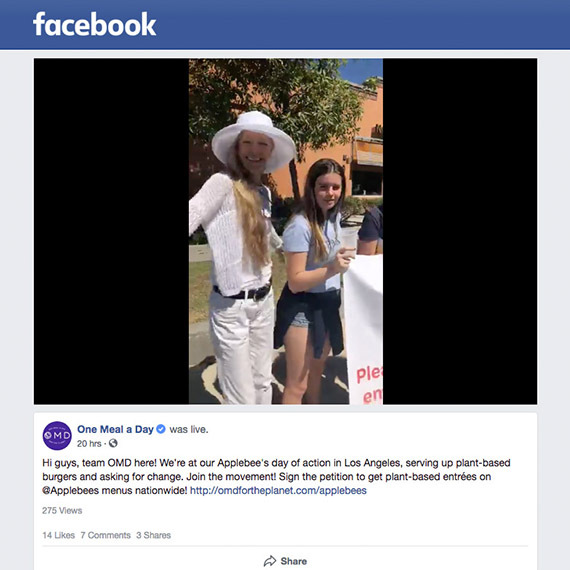 We were also graced by OMD Founder, Suzy Amis Cameron who stopped by to speak to passersby to help raise awareness around why changing menus matters in a time of changing climate and widespread chronic illness. In San Francisco, we passed out hundreds of burger samples, collected dozens of petition signatures and had a very positive response from everyone we met in the streets. We also delivered a letter to the restaurant manager including resources to innovate menus by adding plant-based entrée options. Applebee’s staff members even came out to sign our petition and sample the Hungry Planet burgers. 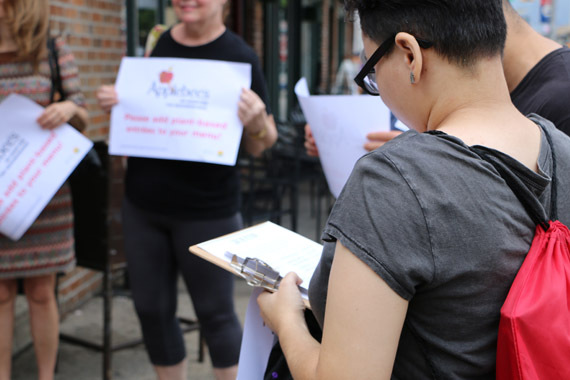 We also delivered letters and had a presence at Applebee’s locations in New York, where we saw a turnout from passionate people who were looking to create change and even in Clearwater, Florida.